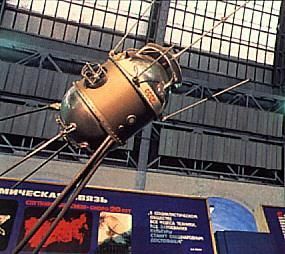 Other satellites in the DS-M series had a similar appearance. Ukrainian technology satellite. Payload developed by the VNIIEM to test electric gyrodyne orientation systems. Also studied variations in the intensity of cosmic rays. Cosmic Radiation satellite built by Yuzhnoye, Russia. Launched 1963 - 1964. Used DS Bus. Status: Operational 1963. First Launch: 1963-06-01. Last Launch: 1964-12-09. Number: 3 . Gross mass: 340 kg (740 lb). Family: Technology, Technology satellite. Country: Ukraine. Launch Vehicles: Kosmos 2, R-12, Kosmos 63S1. Launch Sites: Kapustin Yar, Kapustin Yar Mayak-2, Kapustin Yar LC86/1. Agency: MO, Yuzhnoye. Bibliography: 2, 6, 99, 12259. 1963 June 1 - . 02:50 GMT - . Launch Site: Kapustin Yar. Launch Complex: Kapustin Yar Mayak-2. LV Family: R-12. Launch Vehicle: Kosmos 63S1. FAILURE: First stage failed 4 seconds after launch.. Failed Stage: 1. DS-MT s/n 1 - . Payload: DS-MT. Mass: 340 kg (740 lb). Nation: Russia. Agency: RVSN. Program: DS. Class: Technology. Type: Navigation technology satellite. Spacecraft Bus: DS. Spacecraft: DS-MT. Payload developed by the VNIIEM to test electric gyrodyne orientation systems. Also studied variations in the intensity of cosmic rays..
1964 June 6 - . 06:00 GMT - . Launch Site: Kapustin Yar. Launch Complex: Kapustin Yar Mayak-2. LV Family: R-12. Launch Vehicle: Kosmos 63S1. Cosmos 31 - . Payload: DS-MT s/n 2. Mass: 325 kg (716 lb). Nation: Russia. Agency: MO. Program: DS. Class: Technology. Type: Navigation technology satellite. Spacecraft Bus: DS. Spacecraft: DS-MT. Completed Operations Date: 1964-06-23 . Decay Date: 1964-10-20 . USAF Sat Cat: 803 . COSPAR: 1964-028A. Apogee: 485 km (301 mi). Perigee: 221 km (137 mi). Inclination: 48.90 deg. Period: 91.70 min. Payload developed by the VNIIEM to test electric gyrodyne orientation systems. Also studied variations in the intensity of cosmic rays..
1964 December 9 - . 23:02 GMT - . Launch Site: Kapustin Yar. Launch Complex: Kapustin Yar LC86/1. LV Family: R-12. Launch Vehicle: Kosmos 63S1. Cosmos 51 - . Payload: DS-MT s/n 3. Mass: 350 kg (770 lb). Nation: Russia. Agency: MO. Program: DS. Class: Technology. Type: Navigation technology satellite. Spacecraft Bus: DS. Spacecraft: DS-MT. Completed Operations Date: 1965-01-04 . Decay Date: 1965-11-14 . USAF Sat Cat: 947 . COSPAR: 1964-080A. Apogee: 537 km (333 mi). Perigee: 258 km (160 mi). Inclination: 48.80 deg. Period: 92.60 min. Payload developed by the VNIIEM to test electric gyrodyne orientation systems. Also studied variations in the intensity of cosmic rays, and measured the luminosity of the starry sky..